If you’ve decided you want to learn Arabic, you’re very unlikely to find a classroom course in your local town. If you want to learn a colloquial dialect, you sadly have almost no chance of finding a classroom course. When I was learning Levantine Arabic, I was lucky enough to be living in London, where the University of London specifically offered a Levantine Arabic course. But it was the only one in the whole of the UK. An interactive online course which you study alone at your own pace. Rocket Arabic is a good example. One-to-one lessons with a private teacher, using video calls. iTalki is a great website for finding professional Arabic teachers. What about finding a teacher in your local area for face-to-face lessons? It’s possible, but I’m not sure where you would look. You could try searching for relevant Facebook groups for your town. Why are private Arabic teachers such good value for money? Many of these teachers are living in countries where the cost of living is much lower than in the English-speaking world, so they are able to charge low prices. If you’re going to pursue the route of private lessons. I have one key tip for you. To really make progress in a language, you need to study regularly. At least once a week. When you’ve found a teacher you like, book a package of lessons with them and schedule the lesson times in advance. Having a regular lesson booked every week, will help you progress more quickly. If you don’t schedule a package of lessons in advance, you’ll find it’s easy for a week to pass by without you finding time for a lesson. Or your teacher may be already booked up for that week. The other advantage of booking in advance is that some teachers offer a discount if you book a package of lessons. 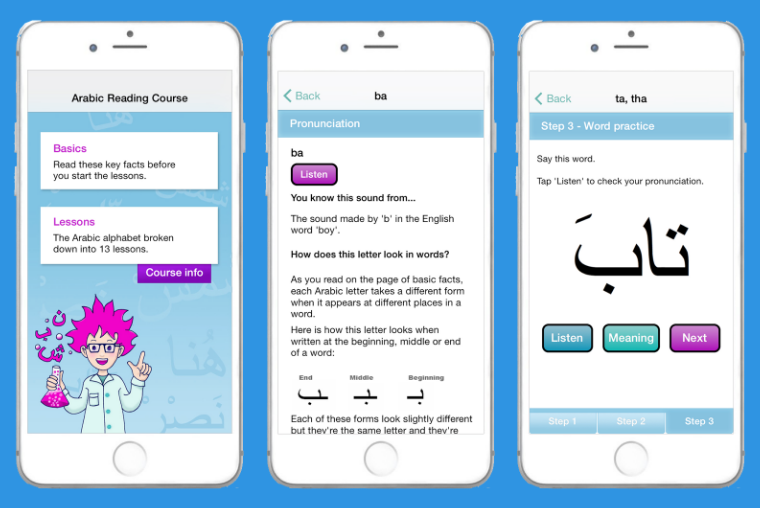 Start by learning the alphabet with Arabic Reading Course and you'll be reading real Arabic words after just two lessons!